This next article is about Top 10 Best Municipal Bond Mutual Funds for the past 3 years. 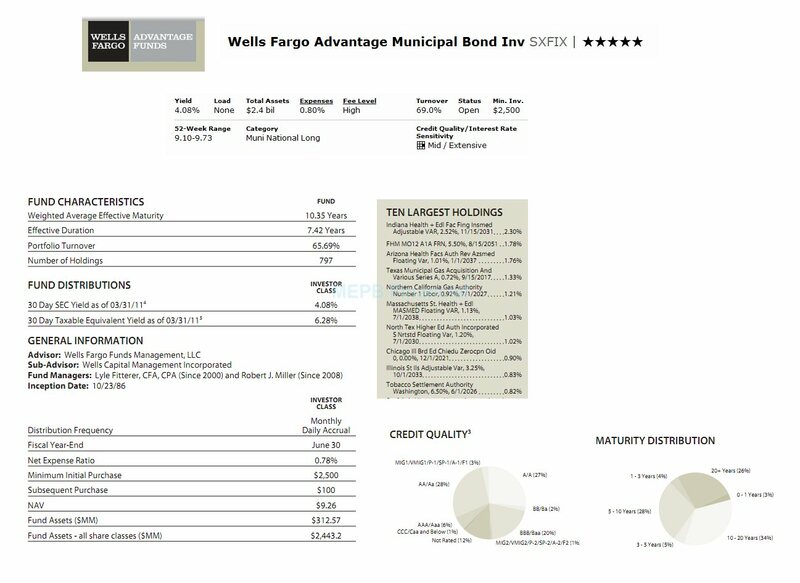 The funds include Wells Fargo Advantage Core Builder, Ivy Municipal High Income I, Nuveen Tax-Free I, Virtus Tax-Exempt Bond I, etc. I also include the individual mutual fund review. 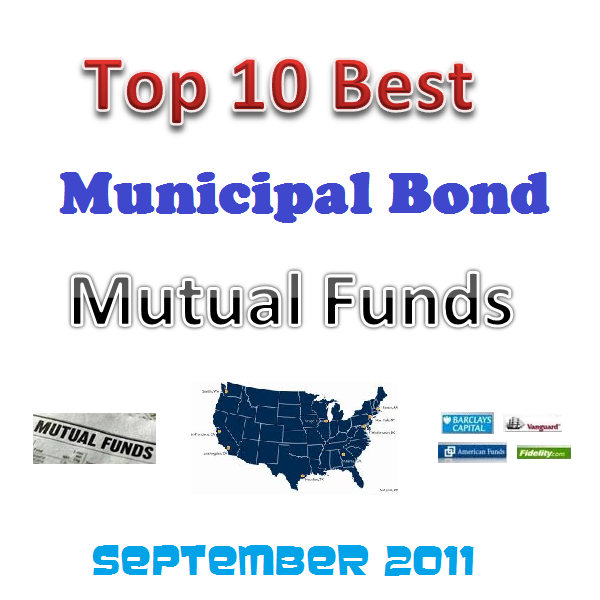 On my previous article, I have provided the Top Performing Muni Bond Mutual Funds. As discussed before, municipal bond funds provide dividend yield exempt from the federal tax rate. These muni bond funds can provide instant diversification to variety of municipal bonds in one fund. In this list, you will find such as national muni bond fund, single state muni bond fund, California muni bond fund, etc. Some of these funds may be categorized as long term muni bond, intermediate term muni bond, or short term muni bond. Consistent performance for the past 3 years and over the long term period. The fund is recognized by Morningstar as one of the best funds with 4 stars or 5 stars rating. It has one of the top fund’s managers in this category. 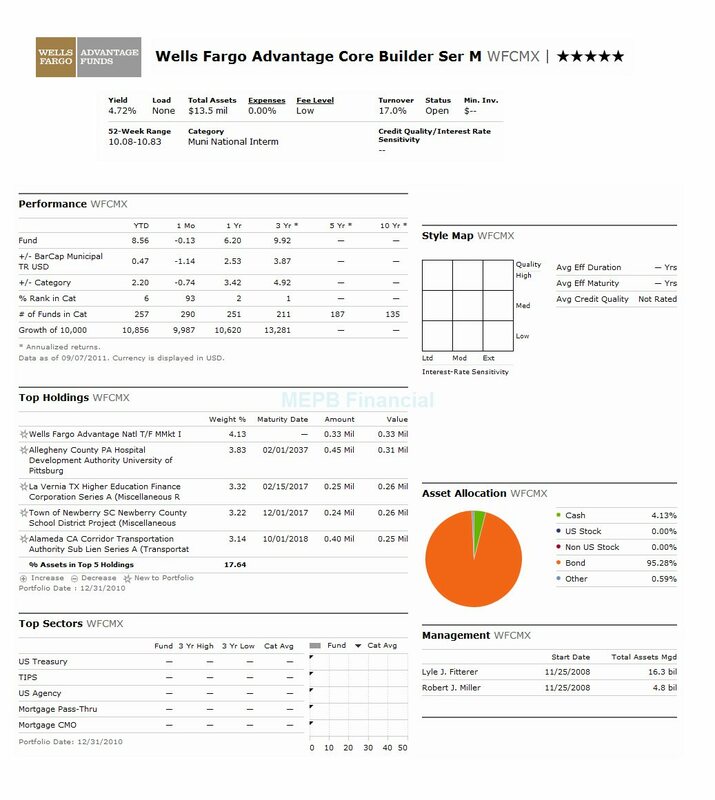 The Wells Fargo Advantage Core Builder fund’s objective is to seek total return by providing current income and capital appreciation. This best rated fund invests most of net assets (>60%) in municipal securities that pay interest exempt from federal income tax, but not necessarily the federal AMT. It can invest <40% of total assets in municipal securities that pay interest subject to federal AMT. This WFA fund typically invests <40% of total assets in below investment-grade municipal securities and <10% of net assets in corporate debt securities. Details about the fund's review is below. This fund was introduced to public in April 2008. The current lead fund’s manager of this fund is Robert J. Miller. He has been managing this fund since November 2008. This fund has 0.0% annual expense ratio, while the average in the Muni National Intermediate category is 0.85%. This WFCMX fund is a no-load fund. Therefore it doesn’t charge any management fee or sales load fee. The YTD return of this fund is 8.06%. Based on the load adjusted return, this WFCMX fund has returned 7.43% over the past year and 10.16% over the past three years. The 3-year beta of this fund is 0.97. This fund is available for purchase only at WFA MF Advisory Updated 05/31/11. As of December 2010, the asset allocation of this fund is 95.28% in Bond, 4.13% in Cash and 0.59% in Other. The Ivy Municipal High Income fund seeks to provide a high level of current income that is exempt from federal income tax. The fund generally invests most of net assets (>80%) in a diversified portfolio of tax-exempt municipal bonds. It invests in bonds rated in the lower tier of investment grade or lower, including bonds rated below investment grade, or junk bonds (rated BB+ or lower by S&P or comparable). The fund typically invests in municipal bonds with remaining maturities of 10 to 30 years. It also invests in higher-quality municipal bonds at times when yield spreads are narrow and the higher yields do not justify the increased risk. This Ivy fund’s manager is Michael J. Walls (since May 31, 2009). The inception date of this fund is December 1998. The annual expense ratio of this fund is 0.70%. This fund has no 12b1 fee and no front-end sales load fee. This no load muni bond fund has net assets of $524.96 million. As part of High Yield Muni bond fund, this fund has 4.97% dividend yield. The dividend is distributed on monthly basis. 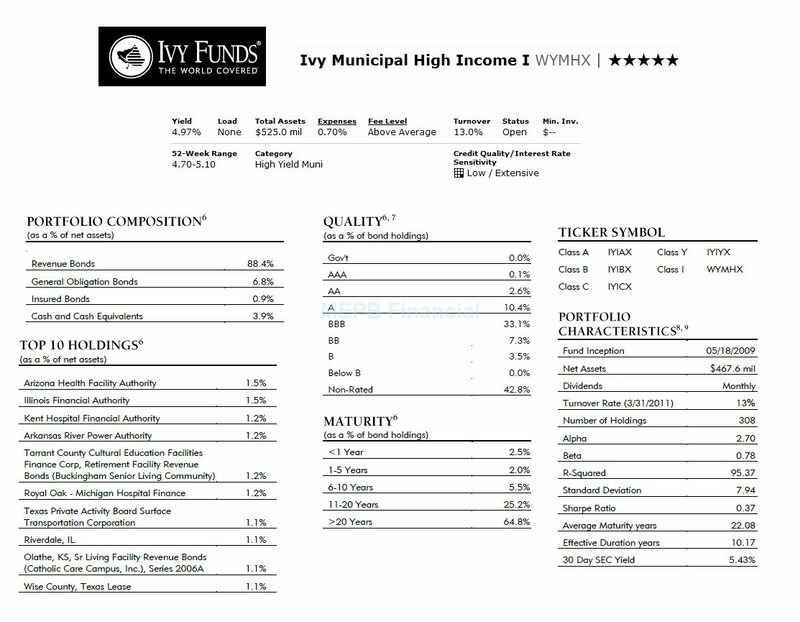 This WYMHX fund has gotten with 5-stars rating from Morningstar. Since its inception, this fund has achieved 10 years with positive 1-year total return with the best performance in 2009 with 32.56%. It has returned 2.94% over the past year and 5.35% over the past ten years. 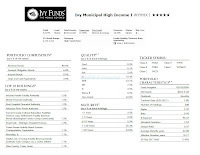 This WYMHX fund has 7.31% YTD return. This fund has average maturity of 22.08 years and an average duration of 10.17 years. As of June 2011, this fund has 308 total holdings. The portfolio composition as of June 2011 is Revenue Bonds (88.4%), General Obligation Bonds (6.8%), Cash & Cash Equivalents (3.9%) and Insured Bonds (0.9%). 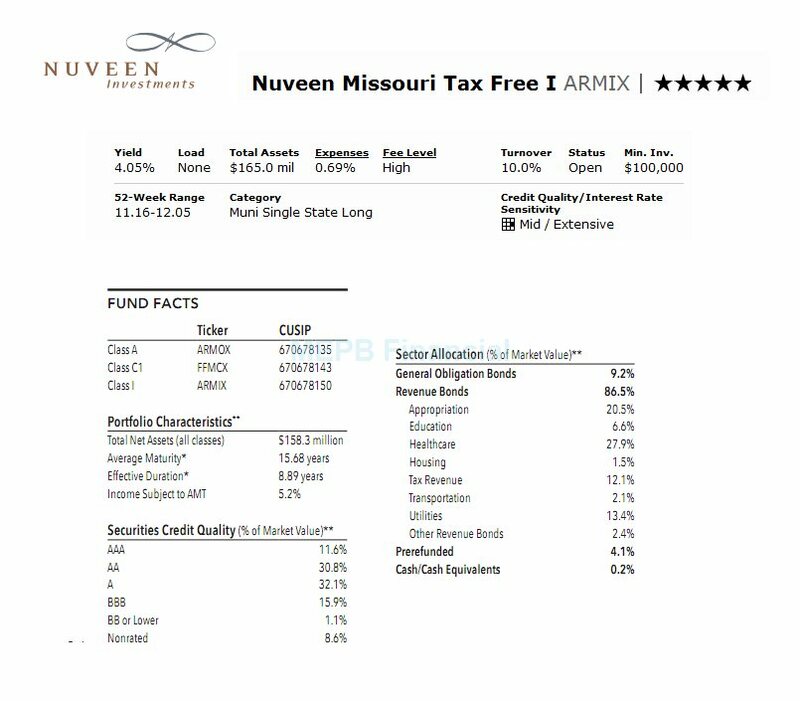 The Nuveen Tax-Free fund is seeking maximum current income that is not subjected to federal income tax to the extent consistent with prudent investment risk. The fund invests >80% of net assets (plus the amount of any borrowings for investment purposes) in municipal securities that pay interest exempt from federal income tax, including the federal alternative minimum tax. It may invest some of net assets (<20%) in taxable obligations. The fund invests primarily in securities that are either rated investment grade or comparable securities. It attempts to maintain the weighted average maturity of its portfolio securities at 10 to 25 years. This muni national long fund was introduced to public in November 1996. Douglas J. White has managed this bond fund since September 2001. This fund has expense ratio of 0.64% per year. This expense fee is a bit lower compared to the average in the Muni National Long category (0.99%). The total net asset of this fund is $441.35 million. This Nuveen Tax-Free fund has gotten 4-stars Morningstar rating. Since 1996, it has performed 12 years of positive return and 2 years of negative return. The best achievement was in 2009 with 26.88%. Based on the load adjusted return, this fund has returned 3.96% over the past one year and 4.49% over the past five years. The current YTD return is 9.24%. The average maturity of this fund is 17.04 years with 9.62 years of effective duration. The other classes for this fund are Class A (FJNTX) and Class C1 (FJCTX). The expense ratio of FJNTX is 0.87%. The top sector allocation of this fund as of June 2011 is Revenue Bonds (84.6%), General Obligation Bonds (10.7%) and Prerefunded (4.7%). 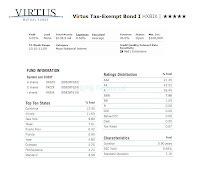 The Virtus Tax-Exempt Bond investment seeks to provide a high level of current income that is tax free from federal income tax. This Virtus fund invests in a diversified portfolio of municipal bonds with varying maturities. It employs an interest rate strategy to help manage the downside risk of rate movements on its portfolio. Under normal market condition, the fund invests >80% of its assets in tax-exempt bonds, generally municipal bonds with varying maturities. As one of the top municipal bond fund, this Virtus fund’s manager is George Selby since 1998. He is assisted by Michael Janik that joined in 2010. The fund charges 0.60% annual expense ratio. This fund has no 12b1 fee and no front-end sales load fee. This fund has a dividend yield of 4.06%. The last dividend was distributed in August 2011 ($0.04). The dividends are distributed on monthly basis. Morningstar has rated this HXBIX fund with 5-stars rating. The fund total net assets are $137.89 million. Since its inception, this fund has recorded 12 years positive performance with the best total return in 2009 with 18.28%. It has returned 2.61% over the past year and 5.12% over the past ten years (based on the load adjusted return). This HXBIX fund has 7.19% YTD return. 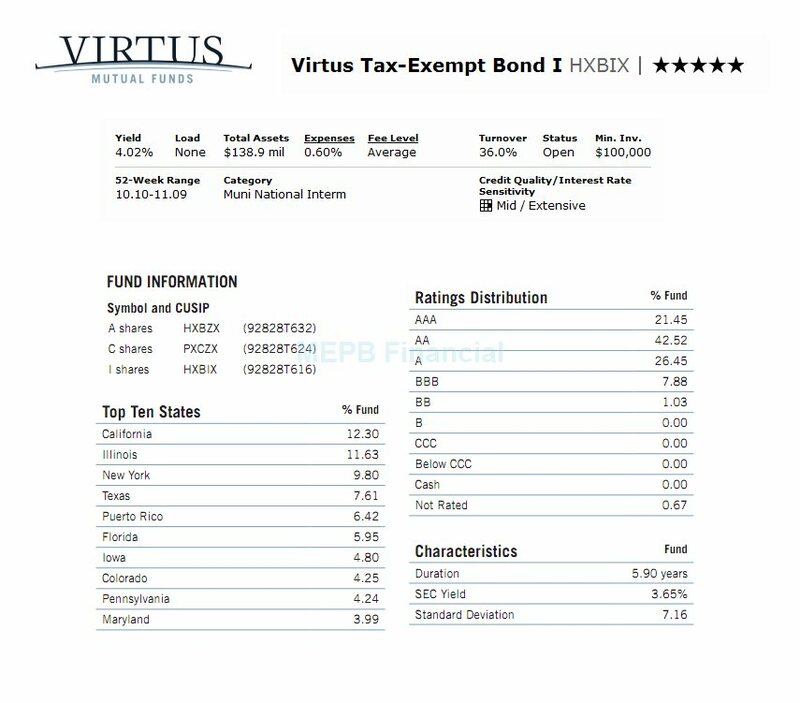 The other classes for this Virtus Tax-Exempt Bond are Class A (HXBZX) and Class C (PXCZX). As of the second quarter of 2011, this fund has a total of 84 holdings. The duration of this HXBIX fund is 5.90 years. The top 10 states of this fund as of June 2011 are California (12.30%), Illinois (11.63%), New York (9.80%), Texas (7.61%) and Puerto Rico (6.42%). 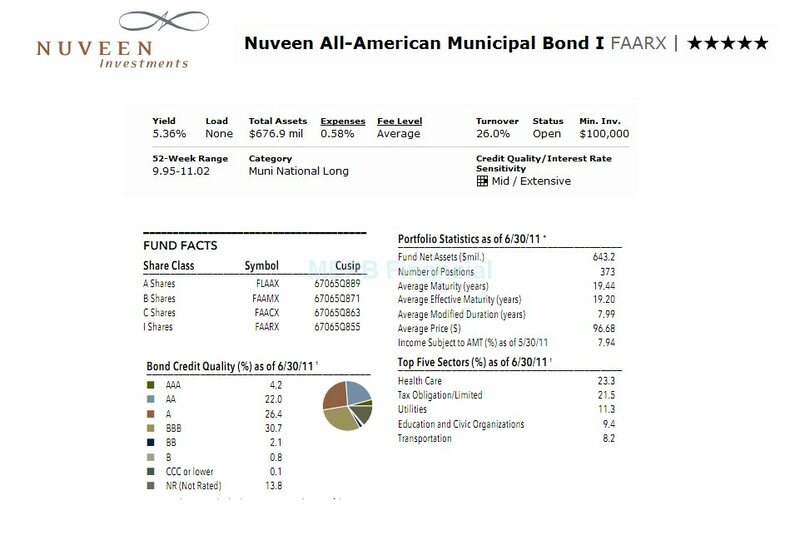 The Nuveen All-American Municipal Bond fund’s objective is to achieve a high level of current interest income exempt from regular federal income taxes, consistent with capital preservation. 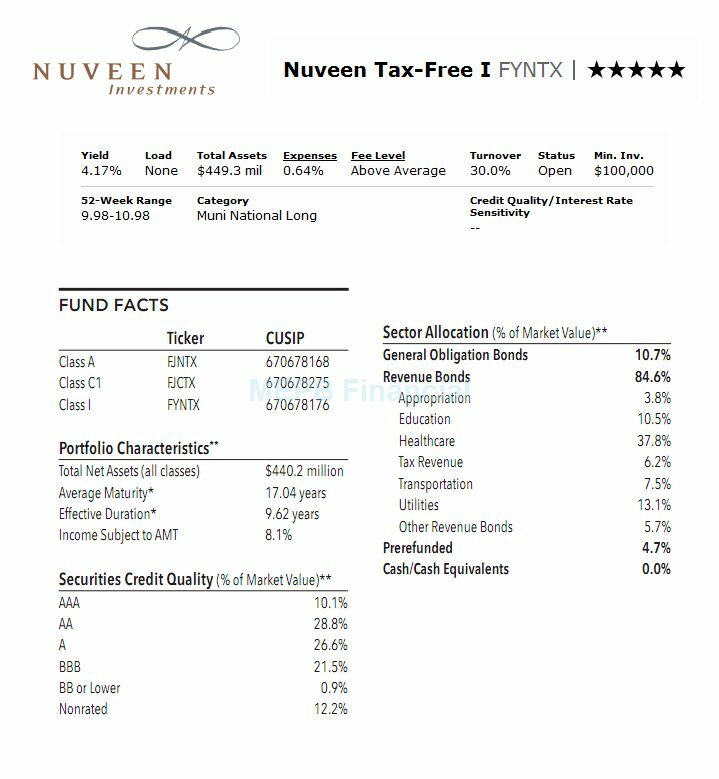 This Nuveen fund invests most of net assets (>80%) in investment grade municipal bonds that pay interest that is exempt from regular federal personal income tax. The fund may invest <20% of net assets in below investment grade municipal bonds, commonly referred to as high yield muni bond or junk rated bond. This FAARX fund is categorized as Muni National Long fund. It has $662.86 million net assets. The yearly expense ratio of this fund is 0.58%. This expense ratio is lower than the average expense in the category of 0.99%. The fund dividend yield is 5.40% and it is distributed monthly. This dividend yield is among the highest yielding muni bond mutual fund in this list. The investor of this Nuveen fund has just gotten their last dividend in July 2011 ($0.05). This fund doesn’t have any management fee and no sales load fee. This fund is managed by John V. Miller since December 2010. The CUSIP of this fund is 67065Q855. 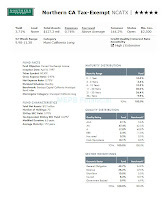 This 5 stars rated fund currently has 9.19% YTD return. As one of the best rated fund, this Nuveen fund has returned 4.43% over the past year, 4.77% over the past 5 year and 4.86% over the past ten years. The best performance was achieved in 2009 with 25.53%. This FAARX fund can be purchased from 41 brokerages, include Merrill Lynch, JP Morgan, Vanguard, Edward Jones, etc. Since its inception, this fund has performed in 11 years of positive achievement and 2 years of negative return. The other classes of this fund are Class A (FLAAX), Class B (FAAMX) and Class C (FAACX). The expense ratio of FLAAX is 0.80% and 0.59% for FAACX. The fund has average maturity of 19.20 years with 7.99 years of modified duration. As of June 2011, the top five sectors of this fund are Health Care (23.3%), Tax Obligation/ Limited (21.5%), Utilities (11.3%), Education and Civic Organizations (9.4%) and Transportation (8.2%). The Schwab Tax-Free Bond fund is providing high current income that is exempt from federal income tax, consistent with capital preservation. The fund typically invests majority of net assets (>80%) in municipal securities, the interest from which is exempt from federal income tax, including the federal alternative minimum tax. The average dollar-weighted maturity is 3 to 10 years. It may invest >25% of total assets in municipal securities financing similar projects. The fund may invest <15% of assets in below investment-grade bonds. It is considered as a non-diversified muni bond fund. This Schwab Tax-Free Bond fund was introduced to public in September 11, 1992. This fund is managed by Kenneth M. Salinger. He has been the fund’s manager of this Schwab fund since March 2008. This fund has a dividend of 2.67% per year. It also has an expense ratio of 0.49% per year. This expense fee is lower than the average in the Muni National Interm category (0.85%). This fund has total net assets of $459.94 million. Investor will need a minimum of $100 to buy this fund online in brokerage account. For IRA or tax deferred account, please check with your brokerage. This fund doesn’t charges any management fee and sales load fee. This fund can be purchased from 59 brokerages. They are Td Ameritrade Inc, Vanguard, JP Morgan, E Trade Financial, Ameriprise Brokerage, Schwab Retail, Firstrade, etc. Morningstar has rated this fund with 4-stars rating. This SWNTX fund has 16 years of positive return since its inception 18 years ago, with the best 1-year total return in year 2000 with 15.58%. The two years with the negative return was in 1999 (with -7.31%) and in 1994 (-6.92%). It has 7.44% YTD return. Based on the load adjusted return, this fund has returned 4.13% over the past year, and 4.84% over the past decade. The average maturity of this fund is 6.4 years. 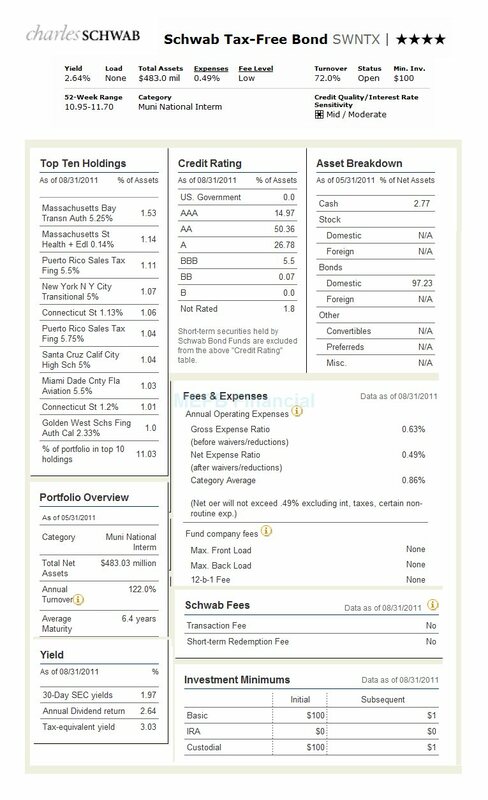 The top asset breakdown of this fund as of May 2011 is 97.23% in Domestic Bond and 2.77% in cash. 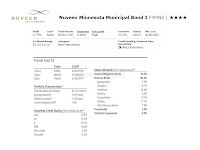 As single state muni bond fund, this Nuveen Minnesota Municipal Bond fund objective is to provide maximum current income that is exempt from both federal income tax and Minnesota state income tax to the extent consistent with prudent investment risk. The fund typically invests most of net assets (>80%) in municipal securities that pay interest that is exempt from federal and Minnesota income tax, including the federal and state alternative minimum tax. It may invest <20% of net assets in tax obligations. The fund attempts to maintain the weighted average maturity of its portfolio securities at 10 to 25 years. 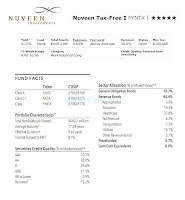 Note: Nuveen is also well known Closed End Funds (CEF) provider. This FYMNX fund is classified as Muni Minnesota Fund. It has been introduced to public in August 1, 1997. The current lead fund’s manager of this Nuveen fund is Douglas J. White. White has managed this fund since July 1988. This is a no-load fund, therefore there is no front end sales load fee or deferred sales load fee. There is as well no management fee. This fund has a dividend of 3.72% and the last dividend distributed was in August 2011 ($0.04). The CUSIP of FYMNX fund is 670678192. The yearly expense ratio of this fund is 0.68% while the average expense ratio in the category is 1.12%. The other classes of this fund are Class A (FJMNX) and Class C (NMBCX). The expense ratio of Class A is 0.86%. Since its inception, this top Nuveen muni bond fund has recorded 11 years of positive return and 2 years of negative return. Based on load adjusted returns, this fund has returned 3.85% over the past year and 4.43% over the past five years. The YTD return of this FYMNX fund is 9.39%. The best achievement was in 2009 with 20.54%. This fund has 5-stars Morningstar return rating. 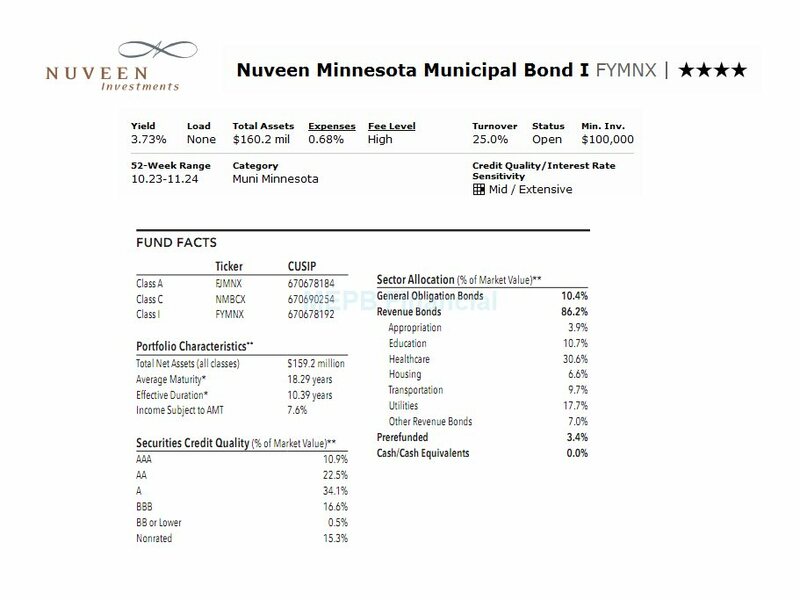 The average maturity of this Nuveen Minnesota Municipal Bond fund is 18.29 years with effective duration of 10.39 years. As of June 2011, the sector allocation of this fund is 86.2% in Revenue Bonds, 10.4% in General Obligation Bonds and 3.4% in Pre-refunded. The Northern CA Tax-Exempt fund is seeking to achieve a tax free high current income from federal income tax and California personal income tax. The fund generally invests majority of the fund's net assets (>80%) in debt instruments that pay interest which is exempt from regular federal income tax. In addition, it invests >80% of net assets in California municipal instruments. The fund may also invest to a limited extent in obligations that are rated below investment-grade or high yield grade. The average weighted maturity normally ranges between 10 and 30 years. This Northern California Tax-Exempt Fund was introduced to public in April 1997. Eric V. Boeckmann has been the lead fund manager of this fund since April 1998. This fund is classified as the Muni California Long fund. This top fund has a yield of 3.81%. This yield is distributed monthly. This NCATX fund has just distributed the dividend in August 2011 ($0.03). The fund charges 0.74% annual expense ratio. The annual expense ratio in the category is 0.96%. There is no 12b1 fee for investing in this fund. There is as well no sales load fee. The minimum initial investment is $2,500 for brokerage account with $50 minimum subsequent investment. For IRA account, the initial investment is $500. This NCATX fund can be purchased from 68 brokerages such as E Trade Financial, T Rowe Price, Vanguard NTF, JP Morgan, etc. This fund has 5-star rating from Morningstar. It has recorded 11 years of positive return and 2 years of negative return. The best performance was recorded in 2000 with 13.97%. 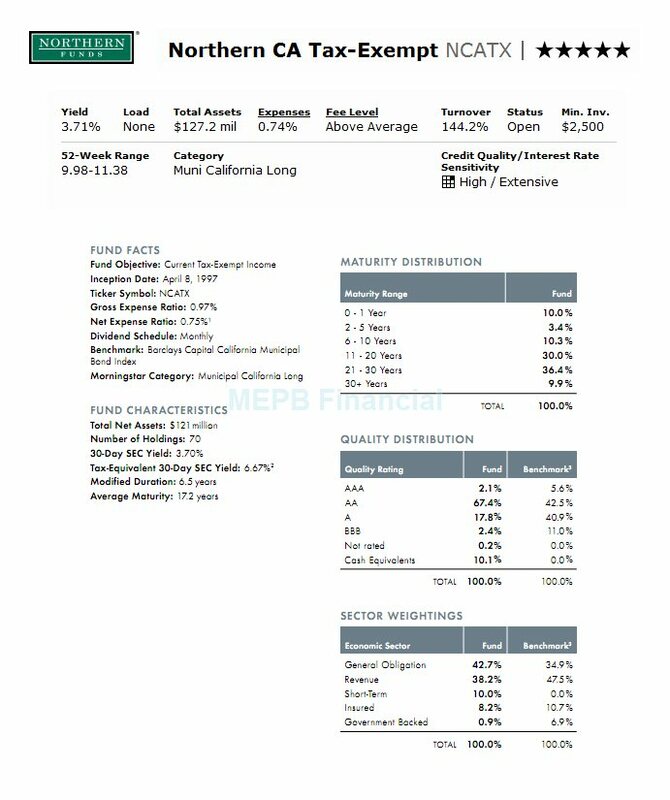 The fund uses Barclays Capital California Municipal Bond Index as its fund’s benchmark. The fund has modified duration of 6.5 years and an average maturity of 17.2 years. The sector weightings of this fund as of June 2011 are General Obligation (42.7%), Revenue (38.2%), Short-Term (10.0%), Insured (8.2%) and Government Backed (0.9%). 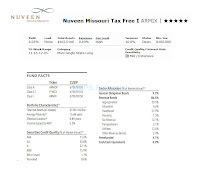 The Nuveen Missouri Tax Free investment seeks maximum current income that is exempt from both federal income tax and Missouri state income tax to the extent consistent with prudent investment risk. The fund normally invests >80% of net assets in municipal securities that pay tax free interest from federal and Missouri income tax, including the federal alternative minimum tax (AMT). It may invest some of net assets (<20%) in taxable obligations. The fund attempts to maintain the weighted average maturity of its portfolio securities at 10 to 25 years under ordinary market conditions. It is non-diversified. Christoper L. Drahn has managed this fund since December 2006. This fund was introduced to public in July 1988. The annual expense ratio of this AMRIX is 0.69%. This fee is lower compared to the average in the Muni Single State Long category (1.02%). There is no management fee and no sales load. The fund total net assets are $163.16 million. This fund has 4.05% dividend yield. It has just distributed its dividend in July 2011 ($0.04). The CUSIP for this ARMIX fund is 670678150. Since its inception, this fund has recorded 19 years of positive return and 3 years of negative return. It has 1.06 three-year beta. The other class of this fund is Class A (Ticker: ARMOX) and Class C1 (Ticker: FFMCX). This fund has 15.68 years of average maturity with 8.89 years of effective duration. As of June 2011, the top 5 sector allocation of this fund is 86.5% in revenue bonds, 9.2% in general obligation bonds, 4.1% in pre-refunded and 0.2% in cash & cash equivalents. The Wells Fargo Advantage Municipal bond fund's objective is to seek income exempt from federal income taxes. The fund typically invests >80% of net assets in municipal securities that pay interest exempt from regular federal income tax, but not necessarily the federal alternative minimum tax (AMT). It invests up to 20% of assets in securities that pay interest subject to federal AMT. The fund invests <20% of total assets in below investment-grade municipal securities. This WFA fund may use futures, options or swap agreements, and other derivatives, to manage risk or to enhance return. The fund’ss dollar-weighted average effective maturity is typically between 5 and 20 years. 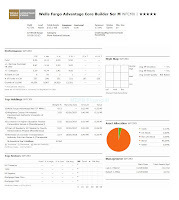 This Wells Fargo Advantage fund is categorized in Muni National Long category. It is managed by Robert J. Miller and Lyle J. Fitterer. The fund was introduced to public in October 1986. The fund has total net assets of $2.52 billion. The average annual expense ratio in the Muni National Long Category is 0.99% while the annual expense ratio of this SXFIX fund is 0.80%. The minimum amount needed to start investing in the brokerage account of this fund is $2,500 and $1,000 for IRA account with $100 minimum subsequent investment. There is no management fee and no sales load fee for investing in this fund. Morningstar has rated this fund with 5-stars rating (i.e. the highest rating). Since its inception, it has 20 years of positive return and 4 years of negative return so far. The worst 1-year total return was occurred in 2008 with -11.67%, and the best achievement was occurred in 2009 with 24.40%. The fund has 7.34% YTD return. Based on the load adjusted return, this fund has returned 4.67% over the past year and 5.54% over the past ten years. The benchmark of this fund is Lipper General Municipal Debt Funds Average. There is no other class for this fund. This fund can be purchased from 79 brokerages, like T Rowe Price, Merrill Lynch, JP Morgan, Dreyfus NTF, Schwab Retail, UBS Financial Services Inc, FIrstrade, etc. As of March 2011, this SXFIX fund has 797 total holdings. The effective maturity of this fund is 10.35 years with 7.42 years of effective duration.